AN565. 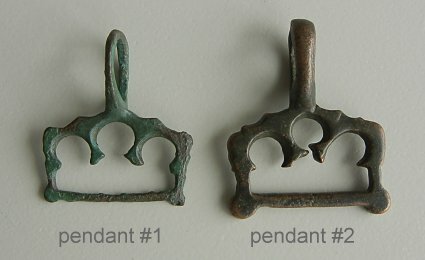 The first ancient bronze fitting on the left looks like the remains of a hinge. There are two spaces under the top tube to use for stringing. 1 1/2 inches tall - $60.US. Pendant #2 has a hole at one end which can be used for stringing. There are spaces within the design that would work too with some imagination. #2 is just under 1 3/4 inches tall - $65.US. AN566. 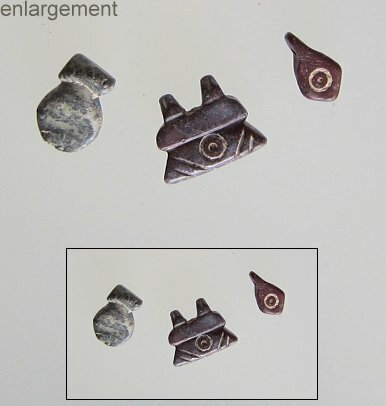 There are two smaller ancient bronze fittings here which can be used as pendants. Pendant #1 is slightly over 1 1/2 inches tall. One of the spaces that you see in the pattern canbe used for stringing - $45.US. Pendant #2 is 1 1/8 inches tall. At the top it has loops (they don't close) and at the other end are two holed pieces that stick out - perfect for hanging - $40.US. AN578. 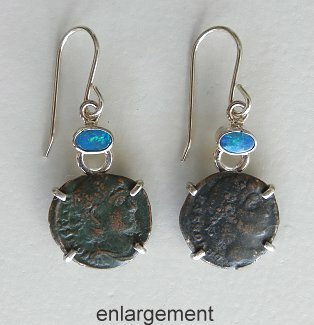 There are two pendants set with ancient Roman coins shown here, with #1 being just under 1 3/8 inches tall and set with an oval pale blue gemstone - $65.US. Pendant #2 is 1 3/8 inches tall and set with a round very deeply coloured facet garnet gemstone - $65.US. AN582. 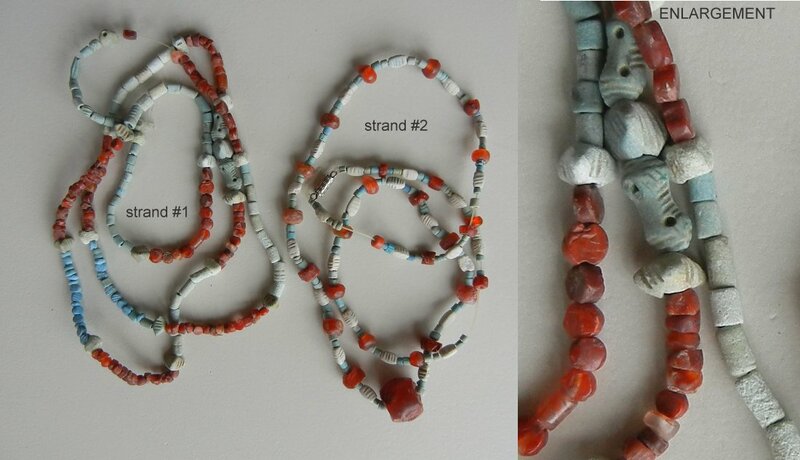 Necklace of ancient carnelian beads out of Afghanistan - 16 inches of beads plus 1 1/5 inch long pendant. (pendant is made of 3 beads) - $385.US. AN585. This ancient Roman ring must have had some sort of stone or stamp in the center of this ring. It is bare but looks great with the dot in the middle. The ring band is a bit flattened rather than round - it was probably under some pressure when buried. It is a size 6.5. $45.US. AN591. 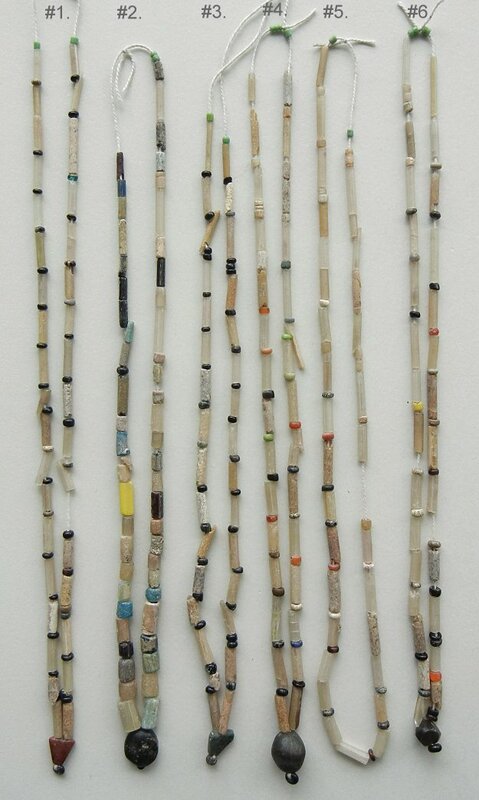 This is kind of a wild strand of beads here. Most are ancient but there are a few more modern ones thrown in as well. The strand has 17 inches of beads on it plus an antique pendant. $95.US. AN594. This is a magnificent necklace - only one like this was made by the jewellery artist. 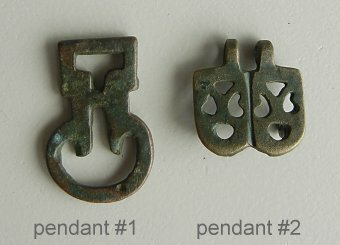 The central dark green bronze piece is from Roman times - perhaps something that went onto a door way or... and is set in sterling silver. It looks beautiful with the four coins, one in each direction. 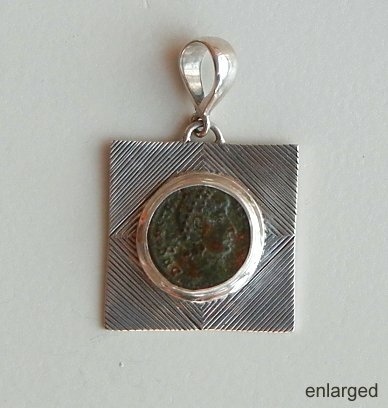 The pendant is 3 1/2 inches tall (including hanging loop) and 3 inches wide. It hands on a sturdy silver chain made in Thailand which is 16 inches around and closes with an "S" hook. The top coin is a Widow's mite (103-76BC) "And Jesus sat over against the treasury, and beheld how the people cast money into the treasury: and many that were rich cast in much. And there came a poor widow, and she threw in two mites... and he called unto him his disciples, and saith unto them - Verily I say unto you, that this poor widow hath cast more in, than all they which have cast into the treasury: for all they did cast in of their abundance; but she of her want did cast in all she had" Mark 12: 41-44"
The coin on the right is Theodosius I (the Great) - Flavius Theodosius (379-395AD) "Reuniting the eastern and western portions of the empire, Theodosius was the last emperor of both the Eastern and Western Roman Empire. After his death, the two parts split permanently. He is also known for making Christianity the official state religion of the Roman Empire." The coin on the bottom is Valentinian I - Flavius Valentinianus (364-375AD) "Was Roman Emperor from 364 until his death. Valentinian is often referred to as the 'last great western emperor'. Valeninian's chief work was guarding the frontiers and establishing military positions. Valentinian was a Christian but permitted liberal religious freedom to all his subjects, proscribing only some forms of rituals such as particular tyles of sacrifices, and banning the practice of magic". The coin on the left is Arcadius - Flavius Arcadius (395-408AD) "Was Roman Emperor in the Eastern half of the Roman Empire until his death in 395AD. Arcadius was not interested in the affairs of the state and the government was rules by others. His brother Honorius ruled the Western half of the Roman Empire". $994.US. AN595. This is a beautiful rare Sassanid (Sassanian) dirhem. One the obverse (the front) is the Great King and on the reverse is an Altar. The coin was made around 200AD. 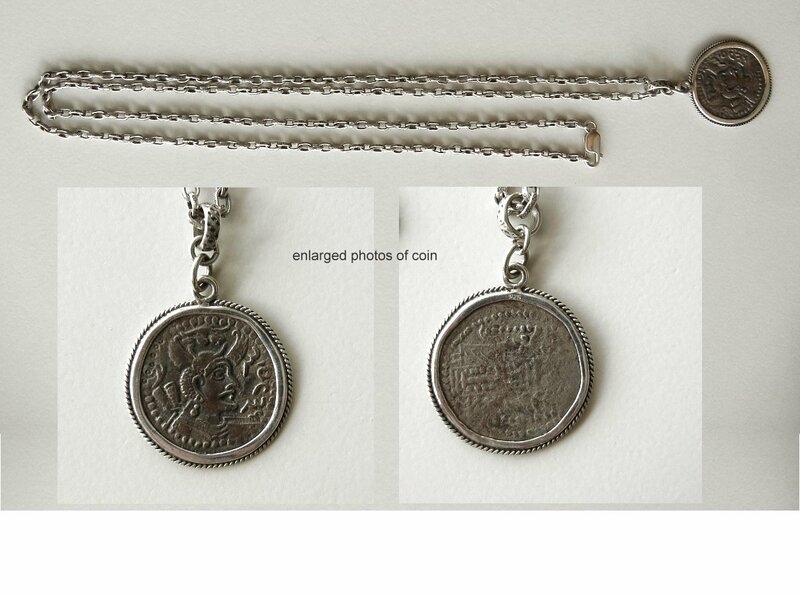 The coins is framed in sterling silver and measures just under 1 1/4 inches in diameter. 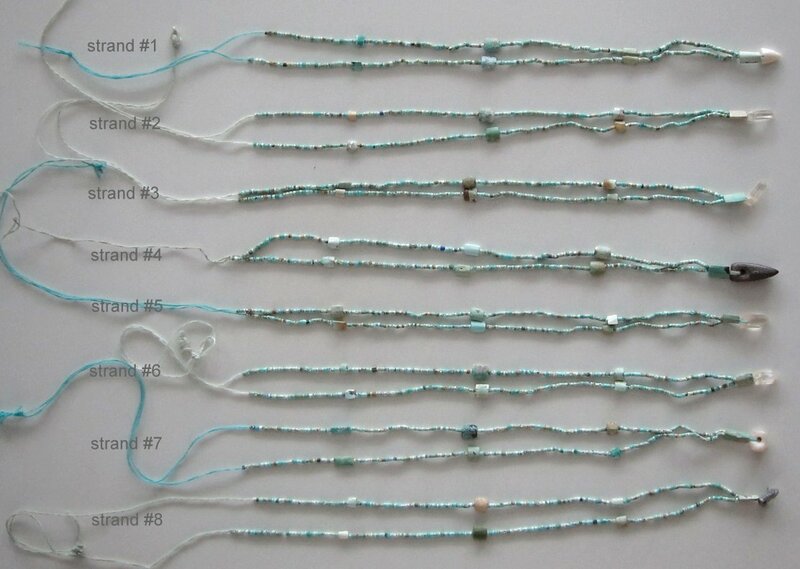 The sterling silver chain was made in Thailand and measures 32 inches around. I find Sassanian ancient material to very magical in its beauty. $468.US. AN596. This sterling silver ring is set with an ancient Roman bronze coin. It is a coin of Constans - Flavius Julius Constans (337-350AD) "In 337 he succeeded his father (Constantine the Great), jointly with his older brothers Constantine II and Constantius II, receiving Italy, Pannonia and Africa as his portion. Constans was tolerant of Judaism but promulgated an edict banning pagan sacrifices in 341. In 341-2, Constans led a successful campaign against Franks. The coin is known as the "Camp Gate" and was struck in Heraclea about 315AD". Size 8. $120.US. AN597. 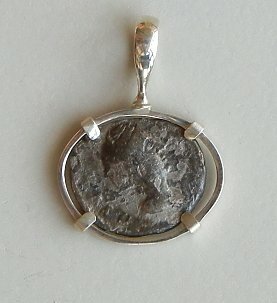 Here is a coin from the Byzantine empire, set in sterling silver. "Some date the beginnings of the Byzantine Empire at 476AD after the Roman Emperor Romulus Augustulus. After the Ottoman Turks conquered Constantinople in 1453AD the Roman Empire completely fell. The terms Byzantine Empire (a historiographical term used since the 19th century) and Eastern Roman Empire are expressions used to describe the Roman Empire of the Middle Ages. The "M" on the reverse of these bronze coins represents the denomination 40 nummi. (M = 40. K = 20. I - 10. E = 5)" the pendant (including hanging loop) is 1 7/8 inches tall. $65.US. AN336. This ancient Roman ring is about a size 4 but not really for wearing. It has a tiny carved seal within it - a profile portrait against clear glass. It is amazingly small about 5/16 inch long. This is an amazing piece for a collection. I haven't done anything to try to clean the ring itself but it seems to be bronze. $225.US. AN341. 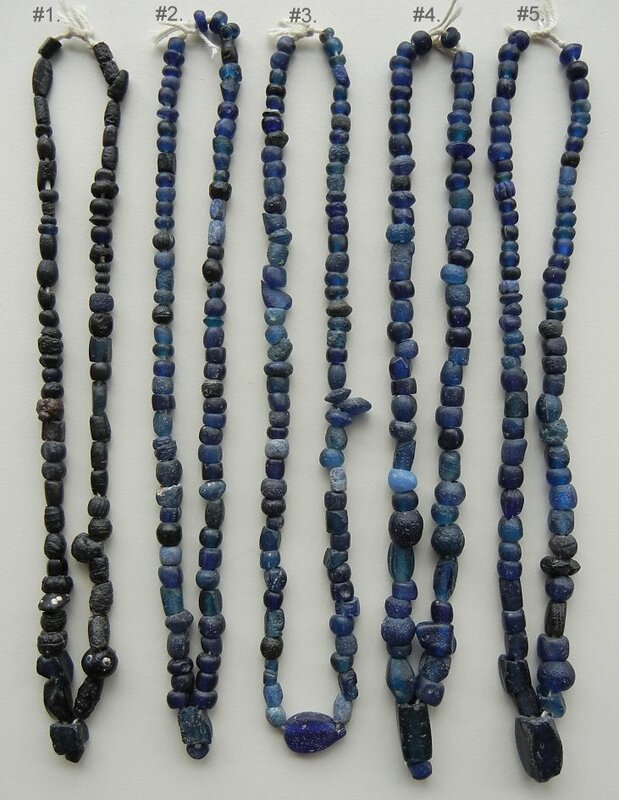 This Islamic bead from the Iran area is recently excavated. It is not fully cleaned as you can see on the photo. 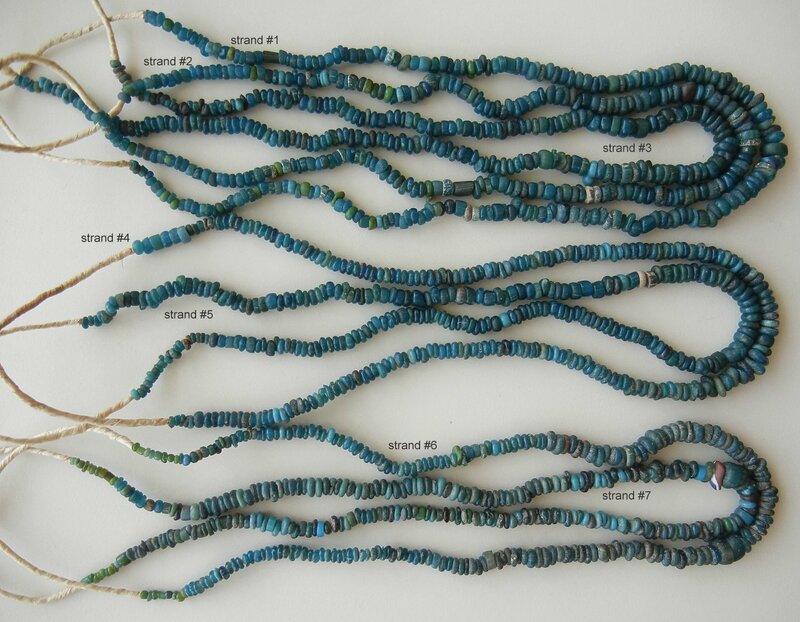 The local museum glass curator suggests that dirt be carefully brushed off but that ancient beads should not be washed. 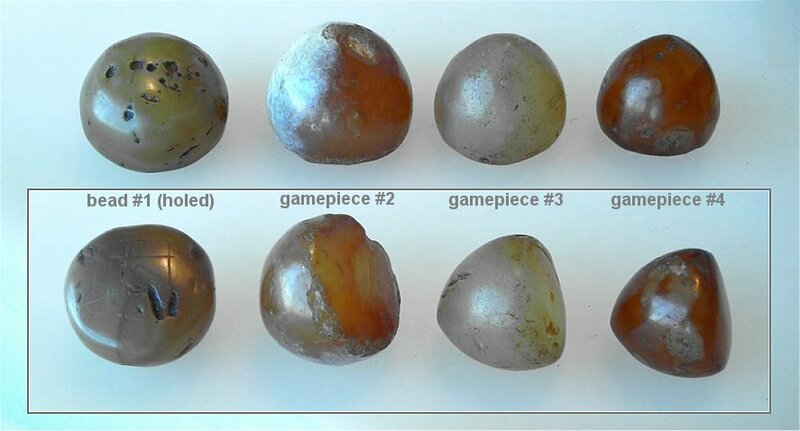 The bead has clear white raised trails on it and the dark base of the bead has some glistening colour from age peeking through. 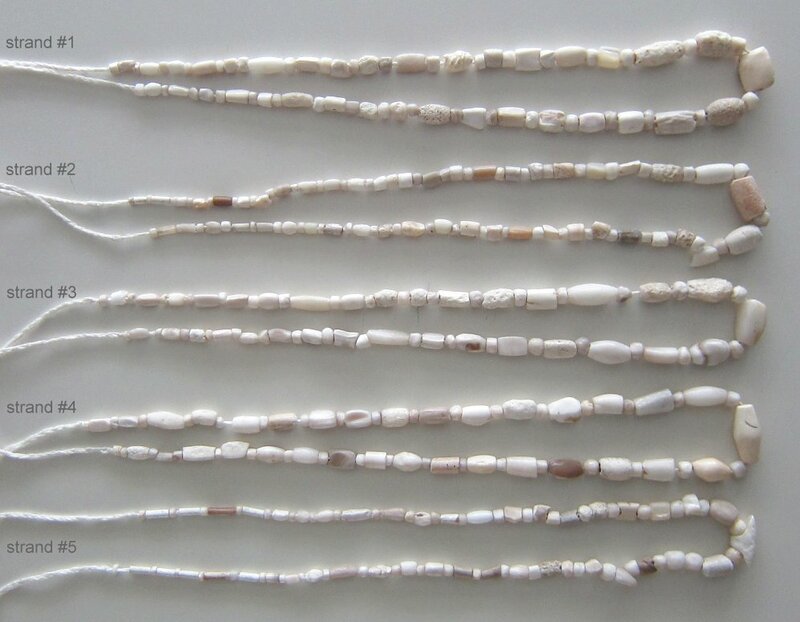 The bead is slightly longer than 7/8 inches long and 1/2 inch in diameter. It is a good clear example. $145.US. AN342. This fat holed faience bead is 7/8 inch across and 3/8 inch tall. 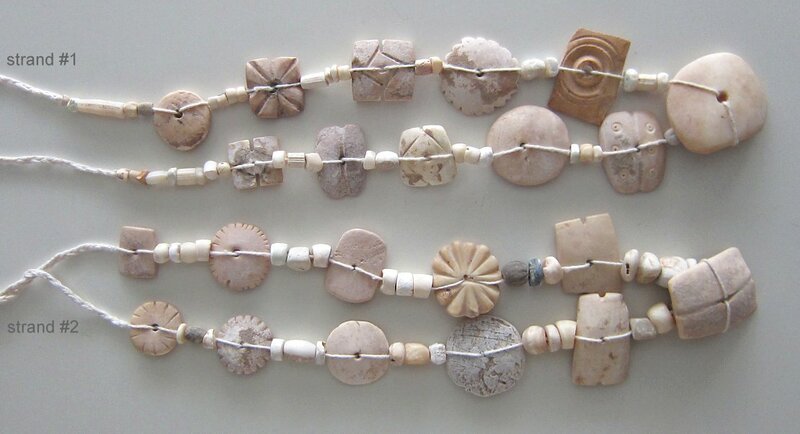 It is from the Persia/Iran area. $35.US. AN361. 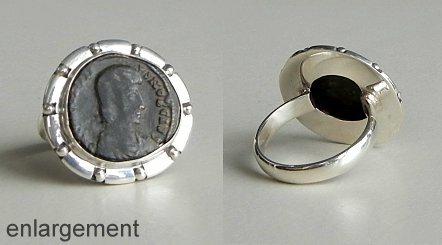 This is a beautifully made silver ring with an ancient coin as its centerpiece. The coin is of Constantius II, Flavius Iulius Constantius minted in the 4th century A.D. He was the second of the three sons of Constantine the Great. Constantius eventually met and crushed Magnentius in the Battle of Mursa Major, one of the bloodiest battles in Roman History. 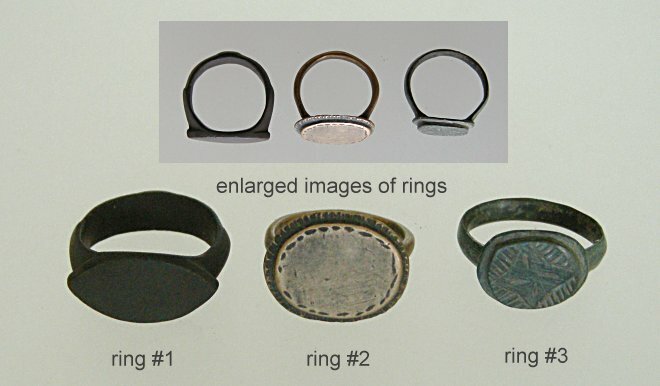 The ring is 1 1/8 inch across from top to bottom in the image, and the coin is just under 5/8 inch across. The ring is a size 8. $75.US. AN362. 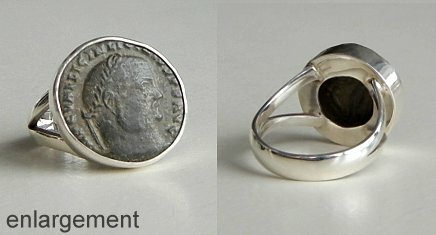 This is a beautifully made silver ring with an ancient coin as its centerpiece. The coin is of Constantius II, Flavius Iulius Constantius minted in the 4th century A.D. He was the second of the three sons of Constantine the Great. Constantius eventually met and crushed Magnentius in the Battle of Mursa Major, one of the bloodiest battles in Roman History. The ring is a little more than 1 1/8 inch across from the top to the bottom of the image, and the coin is just under 5/8 inch across. The ring is a size 7.5. $75.US. AN372. 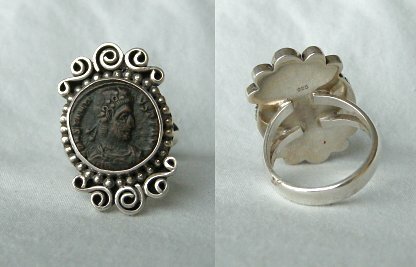 This is a beautifully made silver ring with an ancient coin as its centerpiece. The coin is of Constantius II, Flavius Iulius Constantius minted in the 4th century A.D. He was the second of the three sons of Constantine the Great. Constantius eventually met and crushed Magnentius in the Battle of Mursa Major, one of the bloodiest battles in Roman History. The coin is just over 11/16 inch across. The ring is a size 8. $70.US. AN384. 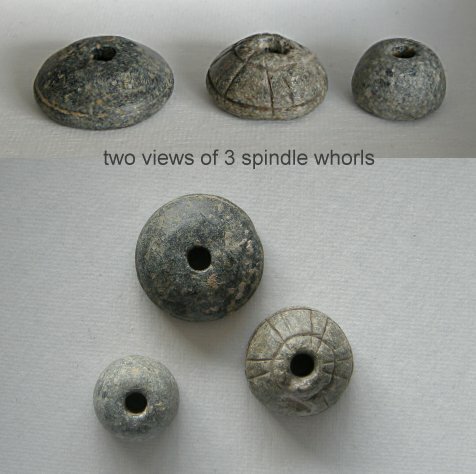 Here are three stone spindle whorls carved in ancient times found in Anatolia. The largest one is 1 1/8 inches across. They can easily be used as beads. 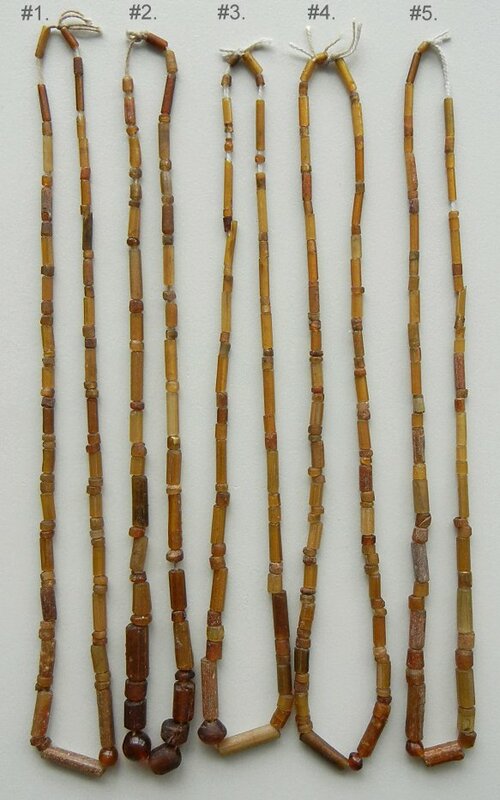 The three beads were part of a collection and are sold together for $225.US. AN388. 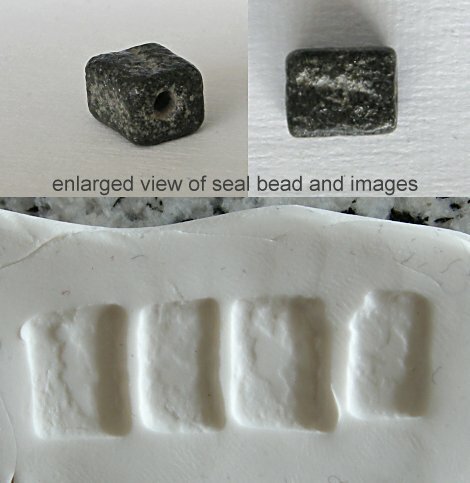 This is a small rectangular seal bead, and I do mean "small". It is 7/16 inches long, 3/8 inch wide and 5/16 inches tall. It is lightly crusted with a patination, and age has made the patterns look quite vague. I believe that the larger images are figures of people judging by the moulded image, but I don't know. $65.US. AN393. This bronze piece is probably an Islamic design (over 800 years old) that was probably originally some kind of belt ornament. I has a very gentle curve to it, and graceful cut-outs. There are no hanging loops but the top cut-outs can be used to put a cord through. The piece is just under 1 7/8 inches across and 1 5/8 inches tall. 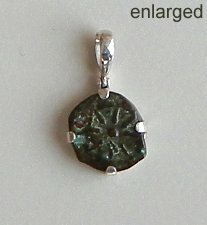 It has a great dark green patina to it - I do like to protect patinas by careful wear. $150.US. AN403. 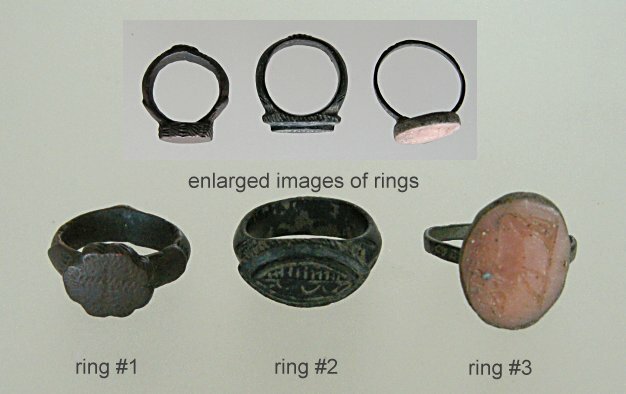 I have a series of ancient rings (almost all are bronze) which I collected 20 years ago or so. They are wearable with one thing to keep in mind. If they are worn often the patina (a coloured coating building up on the ring over many years) will wear down and the metal itself will show again. It is best to maintain the patina as part of the history of the piece. Ring #1 has a nice dark green patina on it. It has a very graceful Islamic shape to it with an "eye" shaped decoration at the front. I like its grace and simplicity. size 8.5 $185.US. Ring #2 has a wide, flat top on it that has no decorations other than a simple dashed line around the edge of the oval. behind that is a ridge which has small lines cut into it, almost like a shallow ruffle. On the side of the oval which lies against the finger are lines radiating outwards from the center of the oval. It is quite perfect. size 8.5 $165.US. Ring #3 is also made of bronze with a dark green patina. It is a Byzantine piece with an attractive design on the front that makes me think of a star image. It could have been used to sign documents on wax. size 8.5 $165.US. AN404. There are three more rings here, each of a distinctive style. Ring #1 has a thick and well decorated band. There are small bits of etching, relief and design all around the band culminating in a sprue decorated with a few diagonal lines. The bezel of the ring is flower shaped and has a cross type design impressed into it with an engraver's tool. AN405. There are two ancient rings here. 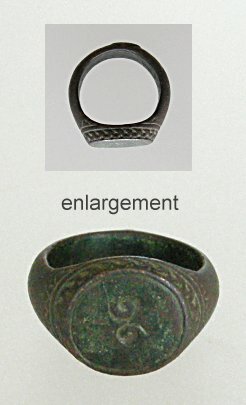 #1 is a flanged ring typical of early Roman ones. 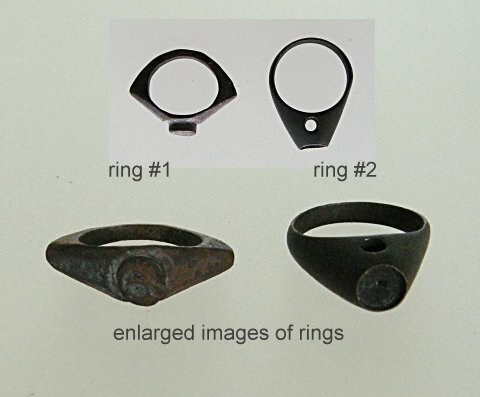 The catalog of the British Museum collection of ancient rings illustrates a few similar types--often cast in gold, but also in silver and bronze. This ring fits beautifully on one of the smallest finger of a woman's hand, and is surprisingly very comfortable. It has a simple design carved into the circular bezel, which may be a very abstraced portrait. I would place this ring around the 3rd Century A.D. size 5. $195.US. #2 is quite interesting in its construction. It has a raised opening where a stone must have sat over a thousand years ago. One could fasten in a correctly sized round cabochon. I don't know what the hole across the ring is for, but think it looks great. size 7 $110.US. AN408. This is a heavy bronze ring made for one of the smaller fingers of a man's hand... It has a dark green patination but one can see the brass underneath at corners. There is some delicate etching around the bezel, and a simple pattern on the top, of two swirls meeting... probably symbolizing harmony, balance, and perhaps infinity. The back of the ring where the original sprue was (the channel where the molten metal was poured into the original mold of the ring) still has a low remnant of the sprue which has been shaped and carved with a flower design. This ring is a very collectible piece. size 9.5 $350.US. AN410. 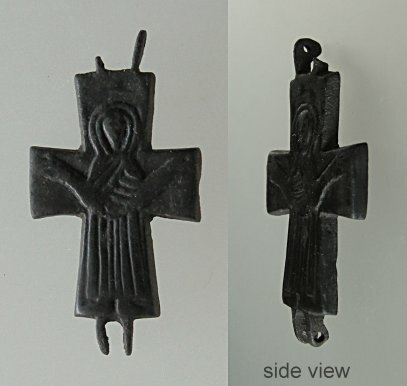 This Byzantine cross from Bulgaria has only one hinge attached to the top portion of the cross so can't be hung upright as is unless you can attach something to the broken hinge - it does have two secure loops at the opposite end. This would normally have been only the front half of the cross. The hinge at the bottom would have attached the front to a nearly identical (but undecorated) back piece. The loops at the top would have interlocked so that when a cord was passed through, the two sides would remain closed. Inside this reliquary cross a pilgrim or a religious devotee would have placed items of devotional and spiritual importance. These crosses are found broken more often than not, and continued to be highly valued and still worn in that state... 2 1/2" high $350.US. AN415. 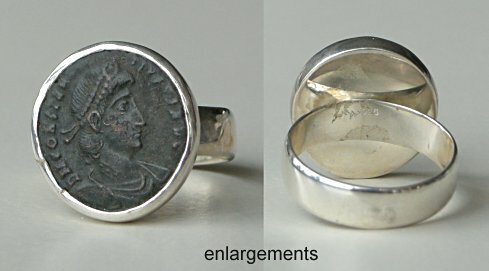 This silver ring (image enlarged) has a bronze coin of Constantius II (Flavius Julius Constantius - Caesar, 323-337; Augustus, 337 - 361 AD). Constantius was the second of the three sons of Constantine the Great. Constantius eventually met and crushed Magnentius in the Gattle of Mursa Major, one of the bloodiest battles in Roman History. Constantius took an active part in the affairs of the Christian church, he is not remembered as a restorer of unity, but as a heretic who arbitrarily imposed his will on the church. Size 9.5. $68.US. AN420. 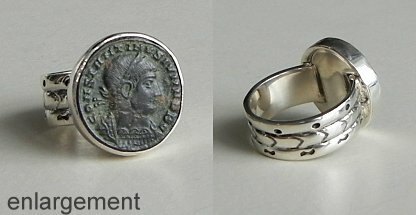 This silver ring (image enlarged) has a bronze coin of Constantius II (Flavius Julius Constantius - Caesar, 323-337; Augustus, 337 - 361 AD). Constantius was the second of the three sons of Constantine the Great. Constantius eventually met and crushed Magnentius in the Gattle of Mursa Major, one of the bloodiest battles in Roman History. Constantius took an active part in the affairs of the Christian church, he is not remembered as a restorer of unity, but as a heretic who arbitrarily imposed his will on the church. Size 9. $68.US. AN421. 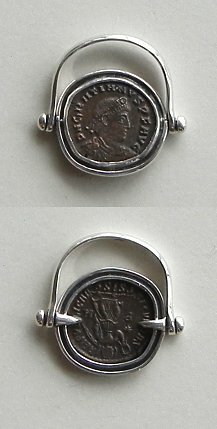 This silver ring (image enlarged) has a bronze coin of Constantius II (Flavius Julius Constantius - Caesar, 323-337; Augustus, 337 - 361 AD). Constantius was the second of the three sons of Constantine the Great. Constantius eventually met and crushed Magnentius in the Gattle of Mursa Major, one of the bloodiest battles in Roman History. Constantius took an active part in the affairs of the Christian church, he is not remembered as a restorer of unity, but as a heretic who arbitrarily imposed his will on the church. Size 9. $78.US. AN422. This sterling silver ring (image enlarged) has a bronze coin of Constantius Gallus (Flavius Claudius Constantius Gallus 325/326 - 354AD) the son of Julius Constantius by his first wife Galla. Gallus' paternal grandparents were Western Roman Emperor Constantius Chlorus and his second wife Flavia Maximiana Theodora. Julius Constantius was also a half-brother of Roman Emperor Constantine I, and thus Gallus was a first cousin of Emperors Constantine II, Constantius II, and Constans. Size 7. $86.US. AN423. 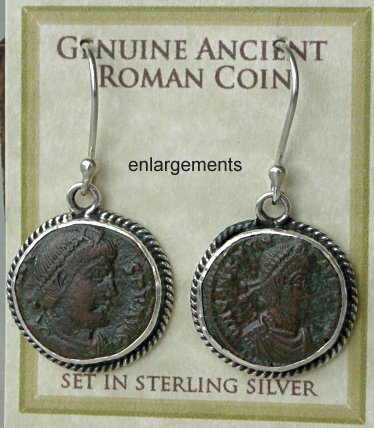 These silver earrings feature two different bronze coins. One coin is of Valens and the other is of Constantius II. 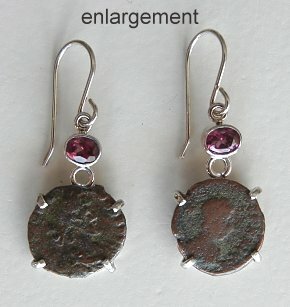 From the top of the earwire to the bottoms of the coins the earrings measure 1 9/16 inches tall. $138.US. Valens (Flavius Julius Valens 364-378 AD) is credited with the commission of a short history of the Roman State. This work, produced by Valens' secretary Eutropius, and known with the name Breviarium ab Urbe condita, tells the story of Rome from its founding. According to some historians, Valens was motivated by the necessity of learning Roman history so that he, the royal family and their appointees might better mix with the Roman Senatorial class. Valens was sometimes known as the Last True Roman Emperor. His succesor was Theodosius I.
AN424. 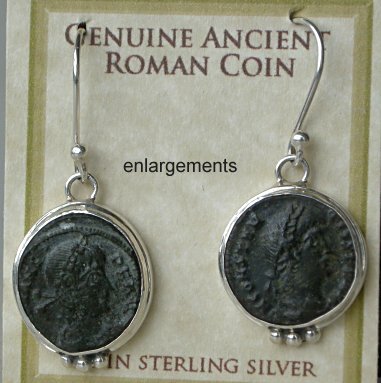 These silver earrings feature two different bronze coins. One coin is of Valens and the other is of Constantius II. 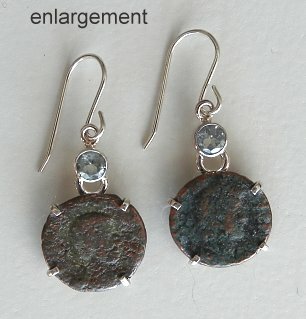 From the top of the earwire to the bottoms of the coins the earrings measure 1 1/2 inches tall. $108.US. AN425. 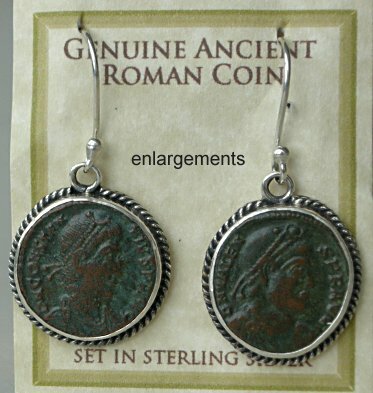 These silver earrings feature two different bronze coins. One coin is of Constantius II and the other is of Valens. 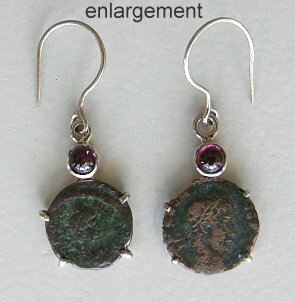 From the top of the earwire to the bottoms of the coins the earrings measure 1 1/2 inches tall. $128.US. AN446. This ring features a coin of Valens - Flavius Julius Valens (364-378AD). Valens is credited with the commission of a short history of the Roman State called Breviarium ab Urbe condita. It tells the story of Rome from its founding. He was motivated by the necessity of learning Roman history, that he, the royal family and their appointees might better mix with the Roman Senatorial class. Valens was sometimes known as the Last True Roman Emperor. His successor was Theodosius I. Size 11.5. $145.US. AN447. 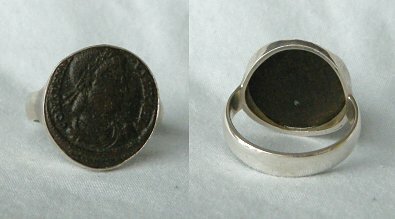 This size 10 ring has an interesting bronze coin sit into it. This is a coin commemorating Romulus and Remus the traditional founders of Rome. They appear in Roman mythology as the twin sons of the priestess Rhea Silvia with the god of war - Mars. Romulus slew Remus ove a dispute about which one of the two brothers had the support of the local deities to rule the new city and give it his name. The name they gave the city was Rome. The twins suckling from the wolf are generally on coins from the Constantine era, circa 306-324AD as a commemorative issue representing the founders of Rome. $160.US. AN449. 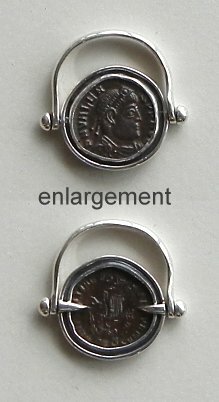 This ring is a size 7 and set with a bronze coin of Licinius. (Flavius Galerius Valerius Licinianus Licinius) (308-324AD) Of Dacian peasant origin, born in Moesia Superior, Licinius accompanied his close friend the Emperor Galerius on the Persian expedition in 297. Galerius elevated Licinius to the rank of Augustus in the west on November 11, 308. He received as his immediate command the provinces of Illyricum, Thrace and Pannonia (the western half of the Roman Empire). $84.US. AN450. Maximianus (Gaius Valerius Galerius Maximinus) (308-313AD) He was originally a peasant named Daia, the nephew of Galerius, his predecessor. He rose to high distinction after he had joined the army, and in 305 he was adopted by his maternal uncle Galerius. He was raised to the rank of Caesar with the governments of Syria and Aegyptus. In 308 after the elevation of Licinius to Augustus, Maximinus and Constantine were declared filii Augustorum (sons of the Augusti). $128.US. AN454. Widows Mite set in silver. See description above. $88.US. AN457. This pendant is of Constantinius II. (Flavius Julius Constantius) (Caesar 323-337; Augustus 337-361AD) Constantius was the second of the three sons of Constantine the Great. Constantius eventually met and crushed Magnentius in the Battle of Mursa Major, one of the bloodiest battles in Roman history. Constantius took an active part in the affairs of the Christian church. He is not remembered as a restorer of unity though, but as a heretic who arbitrarily imposed his will on the church. $88.US. AN464. This is a pendant of Valentinian I. (Flavius Valentinianus) (364-375AD) He was the Roman Emperor from 364 until his death. Valentinian is often referred to as the "last great western emperor". Valentinian's chief work was guarding the frontiers and establishing military positions. Valentinian was a Christian but permitted liberal religious freedom to all his subjects, proscribing only some forms of rituals such as particular types of sacrifices and banning the practice of magic... $68.US. AN469. 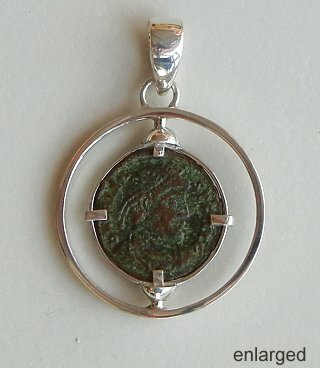 This is a pendant with a coin of Faustina the Elder. (Annia Galeria Faustina) Wife of Roman Emperor Antoninus Pius, Emperor from 138-161AD. Throughout her life Faustina as a private citizen and an empress was involved in assisting with charities, the poor and sponsoring in the education of Roman children, particularly of Roman girls. She founded a charity called Puellae Faustinianae or Girls of Faustina which assisted orphaned girls. She can be viewed as one of the most moral, stable and respected empresses in the history of the Roman Empire. $76.US. AN502. This ring features a coin of Constantine II. (Flavius Claudius Julius Constantinius) (337-340AD) Son of Constantine the Great. Joint emperor with his brothers Constantius and Constans. Constantine II was involved in military expeditions from an early age. In AD323 he took part in Constantine I's campaigns against the Samaritans. Soon after the death of his half-brother Crispus in 326, at the age of 10, he was nominally put in command of Gaul. Constantine II's generals apparently won a victory over the Alamanni. Size 7. $128.US. AN505. This ring has a bronze coin of Constantius Gallus (Flavius Claudius Constantius Gallus 325/326 - 354AD) the son of Julius Constantius by his first wife Galla. Gallus' paternal grandparents were Western Roman Emperor Constantius Chlorus and his second wife Flavia Maximiana Theodora. Julius Constantius was also a half-brother of Roman Emperor Constantine I, and thus Gallus was a first cousin of Emperors Constantine II, Constantius II, and Constans. Gallus was very good looking with soft blonde hair. Size 10. $128.US. AN506. This ring is set with a coin of Licinius. (Flavius Galerius Valerius Licinianus Licinius) (308-324AD) Of Dacian peasant origin, born in Moesia Superior, Licinius accompanied his close friend the Emperor Galerius on the Persian expedition in 297. Galerius elevated Licinius to the rank of Augustus in the west on November 11, 308. He received as his immediate command the provinces of Illyricum, Thrace and Pannonia (the western half of the Roman Empire). Size 11. $148.US. AN507. 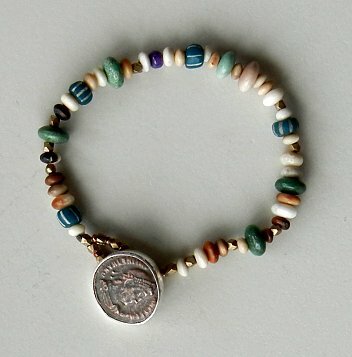 The coin/button on this bracelet is of Valentinian I. (Flavius Valentinianus) (364-375AD) He was the Roman Emperor from 364 until his death. Valentinian is often referred to as the "last great western emperor". Valentinian's chief work was guarding the frontiers and establishing military positions. Valentinian was a Christian but permitted liberal religious freedom to all his subjects, proscribing only some forms of rituals such as particular types of sacrifices and banning the practice of magic... 7 1/3 inches around. $108.US. AN508. 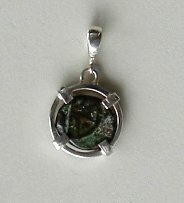 This coin pendant is set with a Widows Mite. 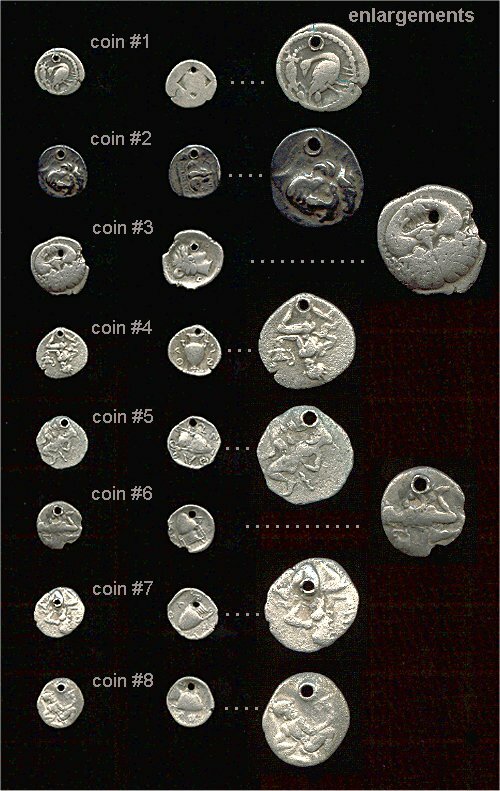 (103-76BC Bibilical coins) "And Jesus sat over against the treasury, and beheld how the people cast money into the treasury: and many that were rich cast in much. And there came a certain poor widow, and she threw in two Mites... And he called unto him his disciples and saith unto them - Verily I say unto you that this poor widow hath cast more in, than all they which have cast into the treasury: for all they did cast in of their abundance: but she of her want did cast in all she had." Mark 12:41-44 $88.US. AN513. This style of ring sold out quickly last time. You flip the coin and it can be worn with either side facing upwards - when it is set aside it sits flat like in the photo. 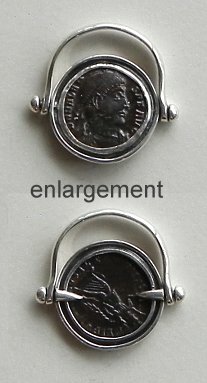 This size 6 ring has a bronze coin of Valens. (Flavius Julius Valens) (364-378AD) Valens is credited with the commission of a short history of the Roman State. This work, produced by Valens' secretary Eutropius, and known with the name Breviarium ab Urbe condita, tells the story of Rome from its founding. According to some historians, Valens was motivated by the necessity of learning Roman history so that he, the royal family and their appointees might better mix with the Roman Senatorial class. Valens was sometimes known as the Last True Roman Emperor. His successor was Theodosius I. $128.US. AN514. This style of ring sold out quickly last time. You flip the coin and it can be worn with either side facing upwards - when it is set aside it sits flat like in the photo. This ring features a coin of Constantine II. (Flavius Claudius Julius Constantinius) (337-340AD) Son of Constantine the Great. Joint emperor with his brothers Constantius and Constans. Constantine II was involved in military expeditions from an early age. In AD323 he took part in Constantine I's campaigns against the Samaritans. Soon after the death of his half-brother Crispus in 326, at the age of 10, he was nominally put in command of Gaul. Constantine II's generals apparently won a victory over the Alamanni. Size 9. $88.US. AN515. This style of ring sold out quickly last time. You flip the coin and it can be worn with either side facing upwards - when it is set aside it sits flat like in the photo. 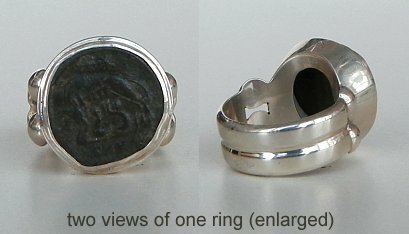 The size 6.5 ring is set with a coin of Valentinian I. (Flavius Valentinianus) (364-375AD) He was the Roman Emperor from 364 until his death. Valentinian is often referred to as the "last great western emperor". Valentinian's chief work was guarding the frontiers and establishing military positions. Valentinian was a Christian but permitted liberal religious freedom to all his subjects, proscribing only some forms of rituals such as particular types of sacrifices and banning the practice of magic... $138.US. AN516. This style of ring sold out quickly last time. You flip the coin and it can be worn with either side facing upwards - when it is set aside it sits flat like in the photo. This size 6 ring has a bronze coin of Valens. (Flavius Julius Valens) (364-378AD) Valens is credited with the commission of a short history of the Roman State. This work, produced by Valens' secretary Eutropius, and known with the name Breviarium ab Urbe condita, tells the story of Rome from its founding. According to some historians, Valens was motivated by the necessity of learning Roman history so that he, the royal family and their appointees might better mix with the Roman Senatorial class. Valens was sometimes known as the Last True Roman Emperor. His successor was Theodosius I. $138.US. AN517. This style of ring sold out quickly last time. You flip the coin and it can be worn with either side facing upwards - when it is set aside it sits flat like in the photo. 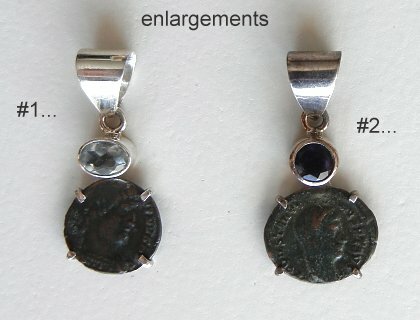 This size 6.5 ring is set with a coin of Gratian. (Flavius Gratianus Augustus) (375-383) He was the eldest son of Valentinian I. During his youth Gratian accompanied his father on serveral campaigns. Upon the death of Valentinian in 375 Gratian's brother Valentinian II was declared emperor by his father's soldiers. $118.US. AN518. This style of ring sold out quickly last time. You flip the coin and it can be worn with either side facing upwards - when it is set aside it sits flat like in the photo. 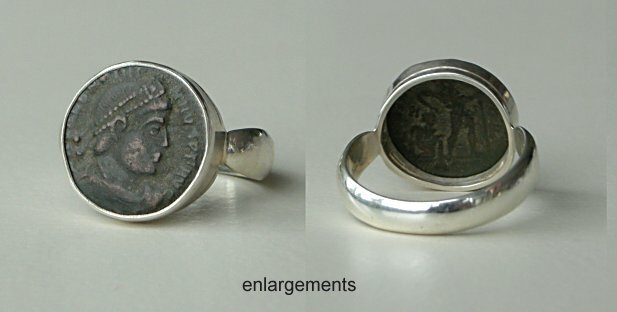 This size 6 ring has a coin of Constantinius II. (Flavius Julius Constantius) (Caesar 323-337; Augustus 337-361AD) Constantius was the second of the three sons of Constantine the Great. Constantius eventually met and crushed Magnentius in the Battle of Mursa Major, one of the bloodiest battles in Roman history. Constantius took an active part in the affairs of the Christian church. He is not remembered as a restorer of unity though, but as a heretic who arbitrarily imposed his will on the church. $98.US. AN534. 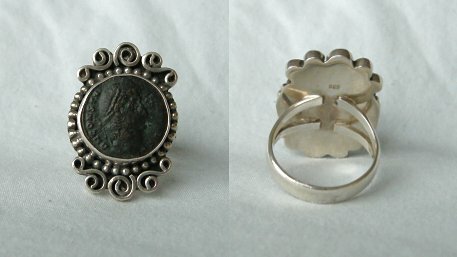 broken top from ancient ring - portrait - $245.US. AN536. 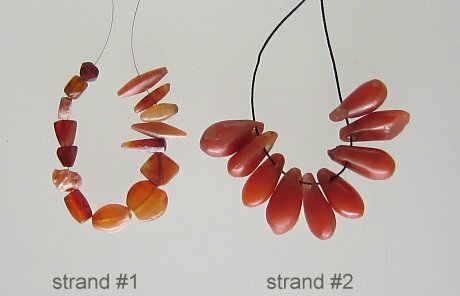 4 3/5 inches carnelian beads - $120.US. AN540. 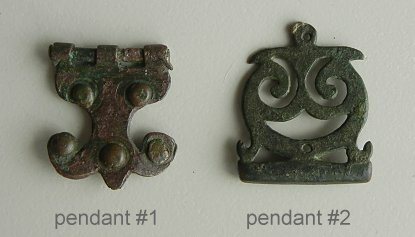 3 ancient pendants - the larger one on the left is 5/8 inch wide at the bottom. $145.US. AN552. 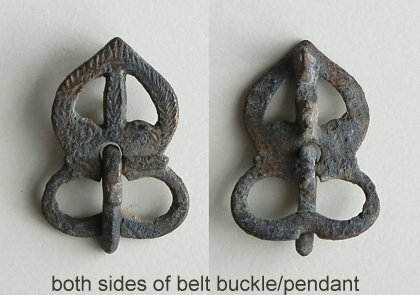 This is part of a Roman Buckle or perhaps a piece from a horse's harness. It is made of bronze and nicely patinated in a dark green. It has holes on the sides and on the top in the photo. The bottom hole isn't pierced all the way through. The piece is 1 inch by 1 3/8 inches. This could be used as an interesting pendant. $35.US. AN553. I have two silver Byzantine coins here, both holed in antiquity. 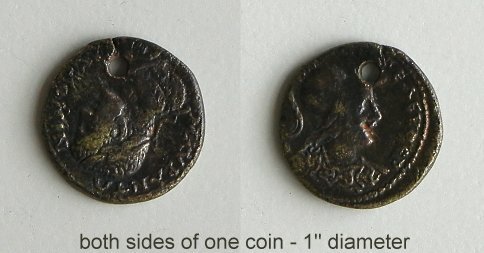 I do not hole ancient coins and hope that others don't either, but keep them in their current form. They are always beautiful with their fine lines and details portraying both Christ and the current emperor. Coin #1 is 7/8 inches across. $110.US. Coin #2 is 3/4 inch across. $95.US. AN495. Here is a sweet small bronze animal from Bactria C. 4th Century BC. It has a pair of horns at the front and pair of ears behind so must be some type of deer. 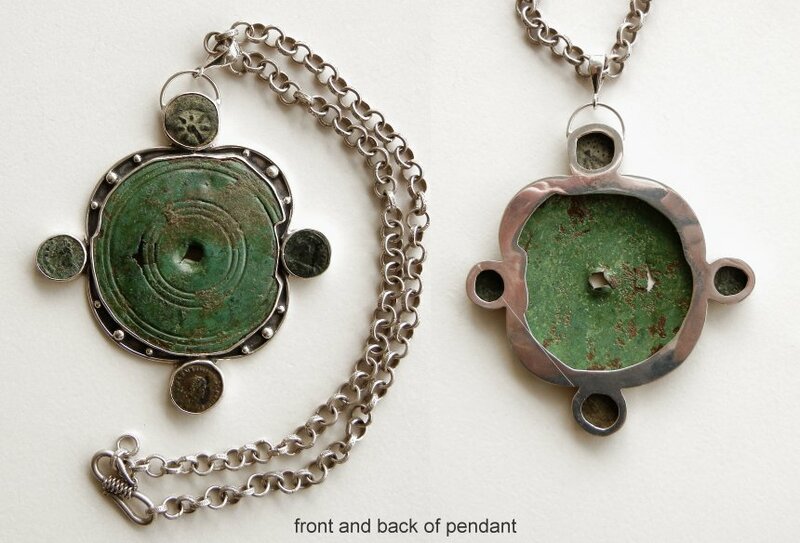 It is holed across the chest to use as a pendant. The creature had an accident hundreds of years ago which removed his front left leg but lost none of his charm. The deer is 1 1/4 inches tall and slightly over one inch from tip of nose to tail. $180.US. AN484. This is a very attractive ancient holed coin. (holed in antiquity). 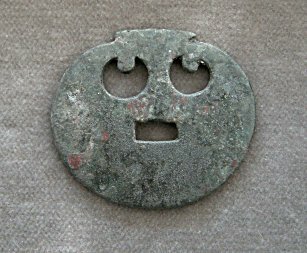 It is bronze and 1 inch in diameter. I was originally told that it is a coin of the Crusades but truly know nothing. 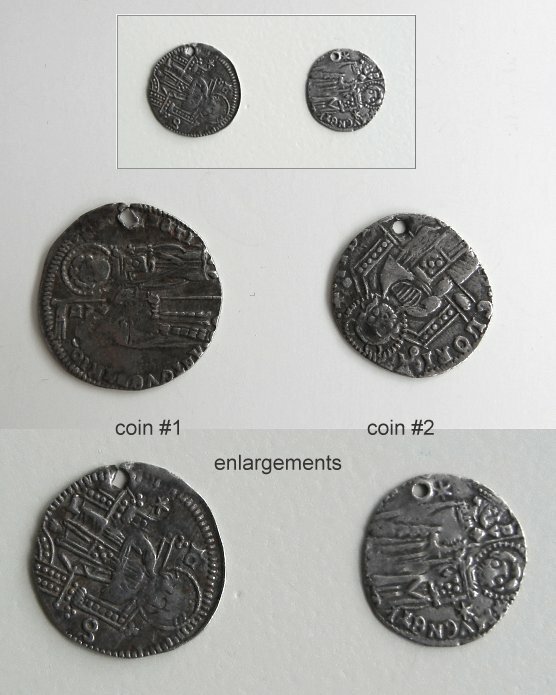 If a coin researcher sees this, I would love to know exactly where the coin is from and what it represents. $75.US. AN485. 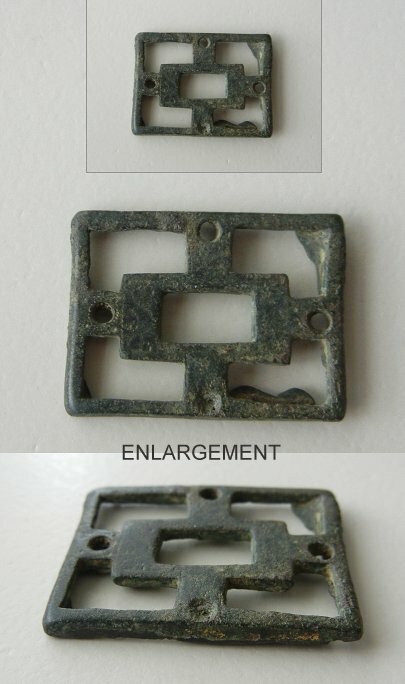 This ancient bronze buckle came out of Bulgaria. It has a brownish patina on it, and will hang nicely as a pendant as it has a 3/8 inch long post behind the point at the top, with a hole going through it where the stringing cord could go. It is attractively decorates with delicate little lines, still visible under the patina. The piece is 2 inches tall. $95.US. AN437. 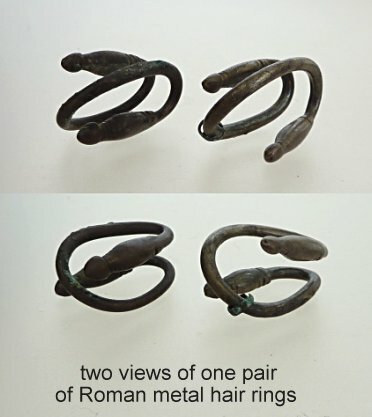 Here is an interesting pair of hair rings from the Roman Empire. After the amount of years that have passed it is not obviously clear what the metal is - it might easily be silver whose surface has changed after long burial. 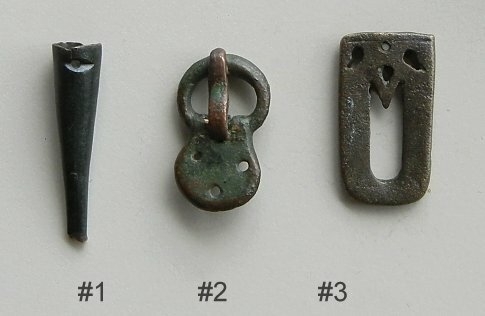 There are some nice details of design on these pieces to give an attractive look when wound around curls or braids - elastic bands didn't exist close to 2000 years ago... One of the loops has a little metal ring around it so perhaps something decorative was once attached. 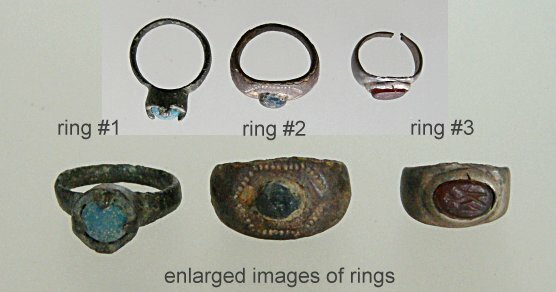 The rings measure about 1 1/4 inches across. $230.US/pair. AN/EA709. 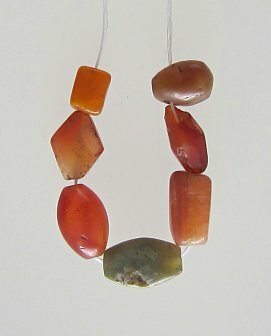 Item #1 is an ancient agate bead with hole going through and remains of ancient patterns. $155.US. There are also three ancient gaming pieces - tall domes with flat bottoms made of agate - very charming and sculptural... #2 - 7/8 inches tall and 1 1/8 inch across - $135.US. #3 - 7/8 inch tall and 1 inch across with dot in the middle of the flat bottom - $125.US. #4 - 7/8 inch tall and 7/8 inch across - $115.US. They are fascinating to look into and to hold against a light. They look very good in a display case.